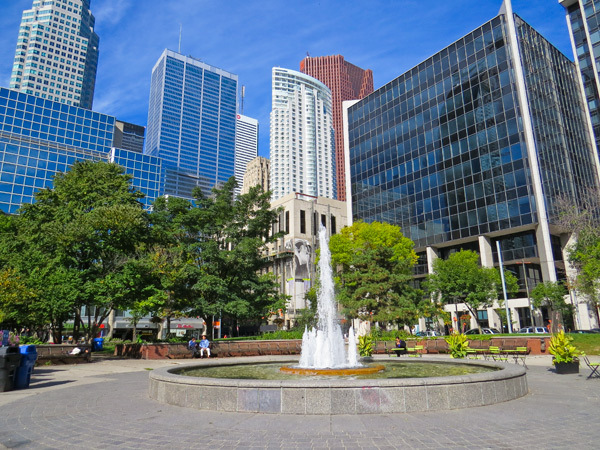 Constructed in 1982 in Toronto’s dense urban core, this park is a central amenity of the Saint Lawrence Market neighborhood. In 1966 the City appropriated the parcel, which was officially dedicated for use as a public park in 1973. One year later it was named to honor William Berczy (born Johann Albercht Ulrich Moll), German-born painter and pioneer who, in 1794, was a co-founder of York (Toronto). The park occupies most of its triangular block and is bordered on three sides by streets and brick-paved sidewalks. To the east, the Gooderham and Worts Flatiron Building, constructed in 1892, faces the park with a large trompe l’oeil mural painted by Derek Besant in 1980. Lampposts file along the park’s northern and southern edges, with deciduous trees planted at intervals between those on the south. 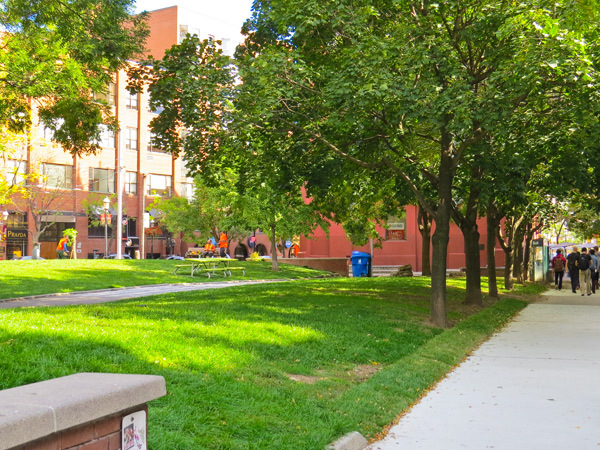 The park has a centralized, circular plaza which connects to a semi-circular plaza to its east by an axial walk, which passes through asymmetrical segments of lawn and groves of trees. Concrete paths from the perimeter on the north, east, and west converge at a circular, raised fountain with jets, around which metal seating springs from brick retaining walls. A bronze sculpture of the Berczy family by Almuth Lutkenhaus has occupied the park’s western edge since 1982. 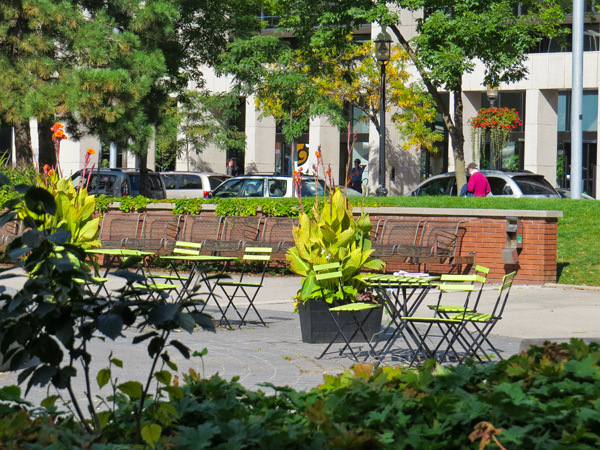 The Berczy Park Revitalization Project was formed by the City in 2013 to address the park’s aging infrastructure.